I think the main thrust of this story is chilling and really important to get straight -- some person or persons unknown is sending forged PDFs to news organization(s), apparently trying to get them to run stories based on forged documents. And I completely agree with Maddow that she was right to send up a "signal flare" to all the news organizations to look out for forgeries. Really, really, really important stuff. This post, though, is going to talk about a detail that Maddow may have gotten wrong, why it may be wrong, and how this bears on the possibility that the Intercept was somehow involved vs. any of the millions of people who downloaded the Intercept's published PDF file. First, let's start with the assumption that the PDF Maddow has is a cloned-and-modified copy of https://assets.documentcloud.org/documents/3766950/NSA-Report-on-Russia-Spearphishing.pdf which is what the Intercept published. 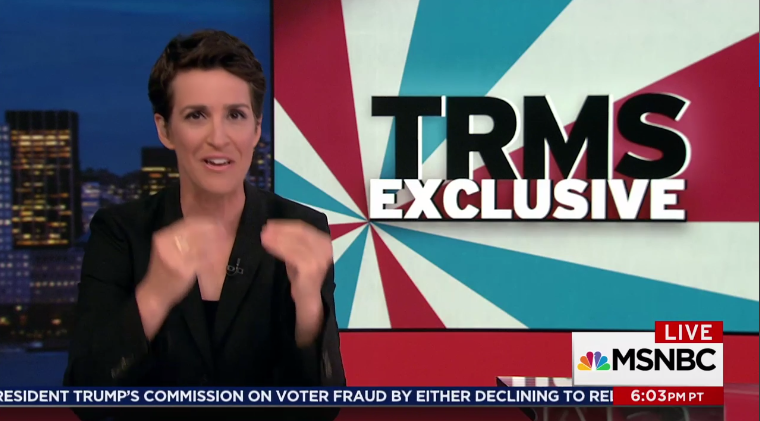 Maddow looked at a bunch of things including the data and metadata of the document. One of the key pieces of metadata was the "creation timestamp" of the PDF file. To be clear, this is just a sequence of bytes in a file and could easily be faked if anybody cared to fake it, something that Maddow made clear too. 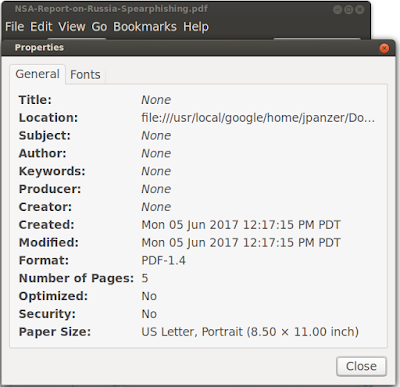 But if you assume that (A) the document is a clone-with-modifications of the Intercept's PDF and (B) the "creation timestamp" embedded in the PDF wasn't faked, there appeared to be an interesting factoid: The "creation timestamp" reported by Maddow for her PDF is 3 hours before the actual publication of the PDF, but of course the PDF would necessarily have been created before it was put up on the web server and 3 hours doesn't seem unusual. And they include a screenshot of the output of "exiftool" which indeed reports (in human readable form) a "Create Date" of "2017:06:05 12:17:15" (with no timezone). It’s also possible that simple time zones explain the discrepancy: that whoever forged the document was in a time zone several hours behind East Coast time, and June 5, 12:17 p.m., in that time zone is after The Intercept’s publication, not before. And with this statement, I jump into the fray, because I'm a software engineer and have had to deal with this kind of technical ambiguity in timestamps way too many times and there might in fact be a way to answer at least this one small question absolutely with no ambiguity at all. It is possible for a PDF file to contain timezone information (see http://www.adobe.com/content/dam/Adobe/en/devnet/acrobat/pdfs/pdf_reference_1-7.pdf, page 160). But sometimes software is stupid, and doesn't record what timezone it's talking about, which is horrible because it leads to confusion. Did the Intercept's file contain a timezone? Most likely, somebody downloaded the PDF file from the Intercept after publication, and modified it, leaving the original creation timestamp alone. The way to tell if the two PDFs have the same or a different timestamp are to open up each one in a binary editor and search for "/CreationDate" and just compare the strings byte for byte, because timestamp formats are horrible and you can't trust the tools to get it 100% right. So here's what you do, Rachel Maddow: Open both PDFs in a binary editor ("vi" works on a Mac). Search for the string "CreationDate". See if the "D:##########" string matches in each of them. If it matches, the files have the same creation timestamp, for whatever that is worth. More broadly, everybody writing software: Just Say No to writing ambiguous timestamps! And if you read one, DO NOT just slap the local timezone on the end like my local properties viewer does. And if it's really, really important, check the bytes by hand.